A copper box of circular form with domed lid and convex base. The top is inlaid in thin gold wire with a figure seen from the back, standing on a rocky promontory in front of a pavilion in a mountainous landscape setting. The scene is contained within double circles. The sides are inlaid in similar technique with branches of pomegranate and finger citron to the cover, and peach and lychee to the bottom section. A single character seal mark, possibly a maker’s mark or reading shou (longevity), is inlaid on the base. 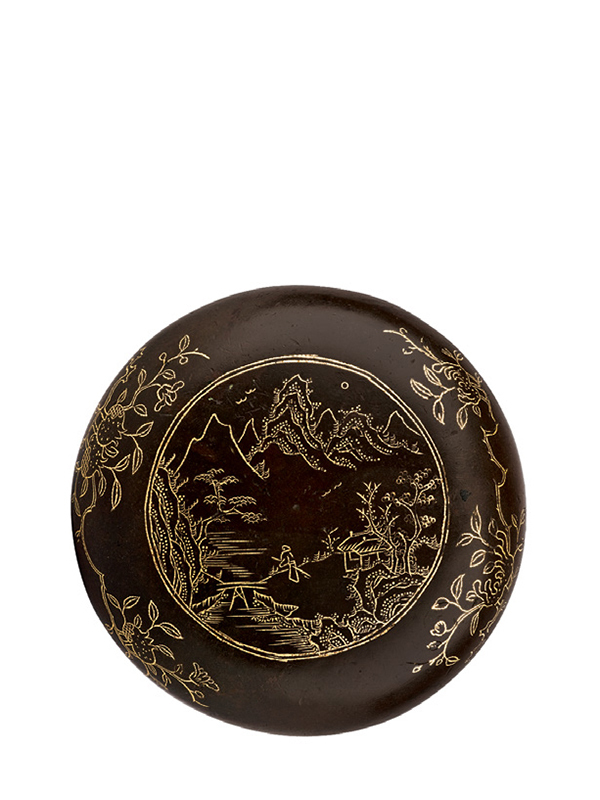 Metal boxes such as the present example were placed on the scholar’s table and usually contain seal paste, or form part of a three-piece incense set, in which case a box like this is intended for powdered incense. First appearing in about the sixth century BC, China’s earliest inlaid bronzes were typically decorated with inlays of copper and semiprecious stones arranged in angular patterns. Those of the fourth and third centuries BC are characterized by fluid scroll decoration, usually inlaid in sheet silver or gold. With the revival of interest in antiquity during the Song dynasty came a renewed fascination with inlaid bronzes, archaic as well as newly made, and they retained their popularity during the Qing dynasty. The main decoration on the cover of this small box may be a reminder to literati to pursue an idealistic life in nature. The decoration of branches of peach, pomegranate and finger citron or ‘Buddha’s hand’ on the present box has a symbolic meaning; depicted together these three fruits represent the sanduo or ‘Three Abundances’, a motif signifying blessings, long life and many sons. The fourth fruiting branch is lychee, of which the Chinese name lizhi is homophonous with lizi, which means ‘establishing a son’, or to have a son so as to continue the family name. A smaller copper incense box of comparable form, inlaid in silver with a dragon and a Wanli (1573 – 1620) mark on the base is in the Clague collection at the Phoenix Art Museum. 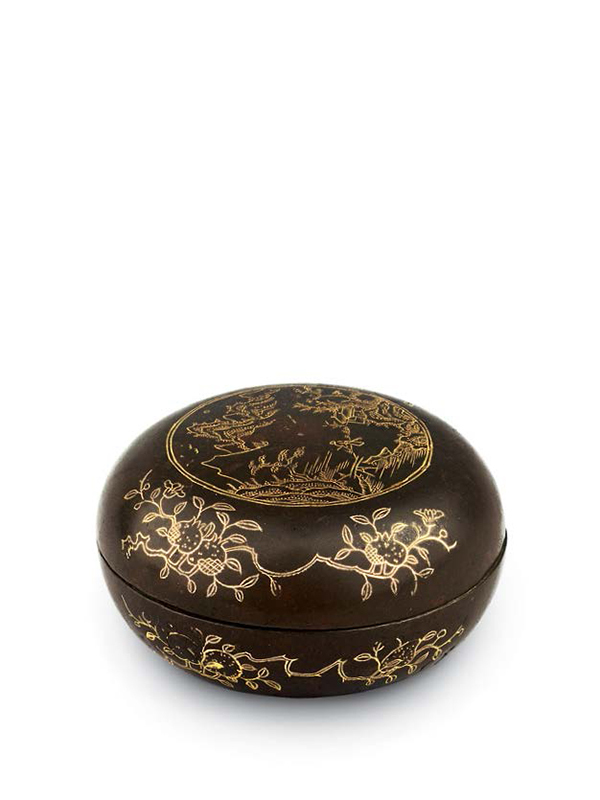 A circular bronze seal paste box with a stylistic dragon motif is in the collection of the Victoria and Albert Museum.